Tilling farm fields in the dark may be a nightmare—not for farmers, but for weeds. U.S. Department of Agriculture research in Rosemount, Minnesota, shows nighttime tillage can cut some weed problems in half. "We're talking about working in absolute darkness," says weed scientist Douglas D. Buhler of USDA's Agricultural Research Service. "Certain weed species have light requirements to break dormancy. Just a brief exposure to a little light from tractors or possibly a full moon may trigger weed seeds to sprout like they do in daylight." However, he says, "Some initial research reports coming from Europe have shown remarkable reductions in weed populations when tillage was done at night. If nighttime tillage also works here, it has the potential to reduce reliance on chemicals in weed management." With daylight tillage, according to Buhler, light penetrates the soil as it is being turned, breaking the dormancy of buried weed seeds. Tilling the soil in the absence of light reduces this occurrence—at least with certain types of weeds. So, last year, Buhler and ARS technician Keith A. Kohler borrowed U.S. military-issue night goggles and drove a tractor and tillage rig in total darkness around some Rosemount cornfields. "Night vision was good enough to perform between-the-row cultivation, and that's an area we are exploring in current research," Buhler says. He and Kohler are based at the ARS National Soil Tilth Laboratory in Ames, Iowa. 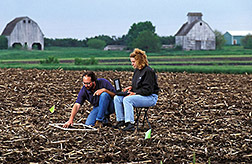 During their studies, Buhler and Kohler documented the effect of night tillage on the emergence of 13 annual weed species. It was the first time so many types of weeds had been tested using night tillage. "Farmers often work at night out of necessity. Now they may have a method to improve weed control at the same time," Buhler says. "I get more done after 6 p.m. than I do before," says Iowa farmer Doug Alert, who lives in Hampton, about 60 miles from Ames. He had read articles about night tilling in European journals and was curious to try it on his 400-acre farm. Alert believes that farmers would cultivate their fields at night if they could be convinced that the practice would cut weed emergence 50 percent or more without using herbicide. He says he only uses chemicals "on an as-needed basis, spending about $5 to $7 per acre for them. Most farmers use $20 to $30 worth per acre." According to Buhler, interest in night tillage has come from sustainable and organic farmers who want to use less chemicals. But he adds, "night tilling isn't the answer to everyone's weed problems. Obviously, farmers would need to change the timing of their work schedule during the planting and growing season. It would also be important for them to understand the susceptibility of the weed species in their fields." But Thompson cautions, "Any system to control weeds must be practical." For instance, he does not believe that ridge planting in darkness is feasible. Of another approach, he says, "We built a cover attachment for our planter to exclude light so we can plant during daylight and still gain the benefits of tilling at night." Last year, he tried tilling at night. This year, that field is planted to corn with no herbicide applied to control weeds. "We did some day and night tillage to cultivate fields," Thompson says. "I'm anxious to see which system works better." Detailed data on emergence of a wide range of weed species is critical to assessing the effect of night tillage on weeds. Here, agronomist Doug Buhler and Iowa State University student Amy Beatty count emerging weeds. Buhler says, "Our research showed enough promise that we tried it again this year." Data from the second year of field tests is substantiating initial findings. Most small-seeded broadleaf species in the study (common lambsquarters, common ragweed, black nightshade, pigweed, smartweed, and wild mustard) again emerged less after tilling during darkness. "We have seen reductions in weed emergence as great as 80 percent," says Buhler, "but generally reductions are 50 to 60 percent. "Usually, farmers till before planting to stimulate weed growth. They later knock out those weeds come up by tilling or with herbicide or both," he adds. Night tillage postpones or prevents some weed emergence, causing seeds left buried to become less viable and more prone to attack by soil microbes. If fewer weeds appear, that means fewer tractor trips and reduced herbicide use. While results have been encouraging, large-seeded weeds like velvet-leaf and cocklebur still sprouted after night tilling. In addition, annual grass species were not affected. Annual grass species—barn yard grass and green, yellow, and giant foxtail. Large-seeded broadleaf weeds—cocklebur, giant ragweed, and velvetleaf. Small-seeded broadleaf weeds—lambsquarters, ragweed, wild mustard, nightshade, smartweed, and pigweed. These are some of the most troublesome weeds infesting corn and soybean fields in the Midwest. Buhler tilled at night between 11 p.m. and midnight. For comparison, he did daytime tillage and applied the herbicide Roundup between 2 and 4 p.m. An evaluation of the two methods was made by counting weeds that came up 15, 30, and 50 days after tillage. Buhler says many farming operations, such as planting and cultivating corn, can be tricky—even in daylight, let alone at night. But, by combining the night-vision goggles with precision farming tools such as a cultivator row-tracking system, night tilling becomes technically feasible. Farmer Thompson, who has never tried night-vision goggles, doesn't think the goggles are the only or best answer for working at night. He has instead equipped a tractor with a set of lights that shine only out in front of the vehicle, allowing him to see while preventing light from reaching the soil during the tillage operation. Additional research is needed, says Buhler, to determine the light sensitivity of various weed species—as well as the effects of tillage depth, tillage implements, and other factors like crop planting date on the effectiveness of night tillage. "We also need to understand how different tillage implements redistribute weed seeds, so as to minimize the number of seeds that are brought to the soil surface," says Buhler. "Seeds moved to the surface at night would be exposed to light the following morning, reducing the effectiveness of the night tillage." — By Hank Becker, ARS. USDA-ARS National Soil Tilth Laboratory, 2150 Pammel Drive, Ames, IA 50011; phone (515) 294-5723, fax (515) 294-8125. "Nightmare in Tilling Fields—a Horror for Weed Pests" was published in the December 1995 issue of Agricultural Research magazine.